These Freeze and Bake Rolls can be made ahead of time, parbaked and frozen for the big day. Then 12 minutes before serving dinner, throw them in the oven for hot, fresh, homemade rolls with no effort. For me, rolls are pretty much the best part of Thanksgiving. I don’t make homemade bread too often (pizza crust? yes) so I get particularly excited about the bread when the holidays roll around. The only thing that makes it tricky is how much work and planning it takes to pull them off with the rest of the Thanksgiving spread. Make the dough. Rise the dough. Form the rolls. Rise the rolls. Bake the rolls. You get the picture. It’s a lot. And I mean, sure, you can buy your rolls from the store (and ain’t no shame in that game) but hot, fresh, homemade rolls are an absolute must have at our house. In comes these Freeze and Bake Rolls to save the day. 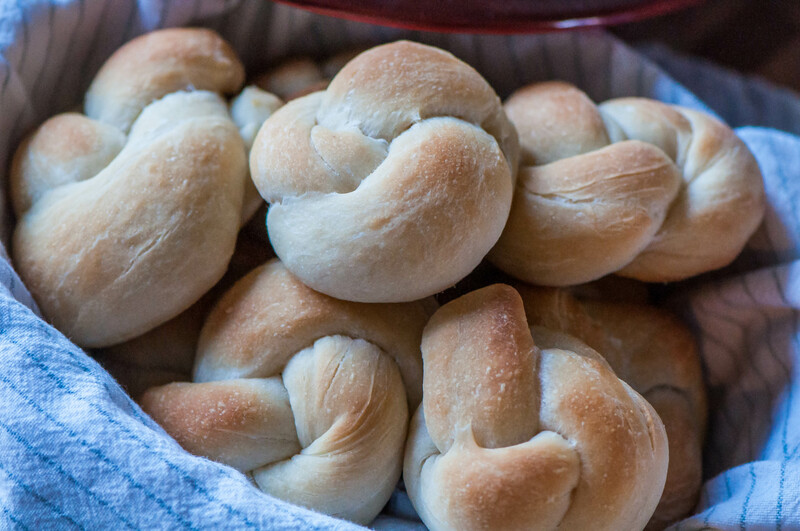 You can make the dough, rise, form and parbake these rolls days or weeks in advance of your big event then all you have to do is throw them in the oven, directly from the freezer. You also have the option of baking them right away. And because I love you and bread I tried them both ways. For research. And to make sure I gain those extra few holiday pounds apparently. Anyway…they are deliciously fluffy and perfect both ways. They have a great yeasty flavor to them and are great for sopping up gravy. The recipe yields 4 dozen so just bake up as many as you need and keep the rest in the freezer. I’m excited to have these ready to go in the freezer for any random meal that needs (yes, sometimes dinner NEEDS bread) rolls. I can just pop 4 in the oven and look like a rock star. So get to making these today or tomorrow so you only have to worry about turkey, potatoes, stuffing and that crazy relative. In the bowl of a stand mixer, dissolve the yeast in warm water. Add 2 teaspoons sugar; let stand for 5 minutes. Add the milk, oil, salt, remaining sugar and 2 cups of flour; beat until smooth using the paddle attachment. Switch to the dough hook. Mix in enough flour to form a stiff dough. Turn mixer to medium speed and knead until smooth and elastic, about 6 to 8 minutes. Place in a greased bowl, turning once to grease the top. Cover with a tea towel and let rise in a warm place until doubled, about 1 1/2 hours. Punch dough down. Turn onto a lightly floured surface; divide into four pieces. Cover three pieces with the tea towel. Divide remaining piece into 12 balls. To form knots, roll each into a 10-inch rope; tie into a knot and pinch ends together. Repeat with remaining dough. Place rolls on greased baking sheet. Cover and let rise until doubled, about 20 to 30 minutes. Brush with butter. To serve immediately, bake at 375 degrees for 15 to 18 minutes. To freeze for later use, partially bake at 300 degrees for 15 minutes. Remove from pans to wire racks to cool. Place in a labeled freezer bag. Reheat frozen rolls at 375 degrees for 12 to 15 minutes or until browned.